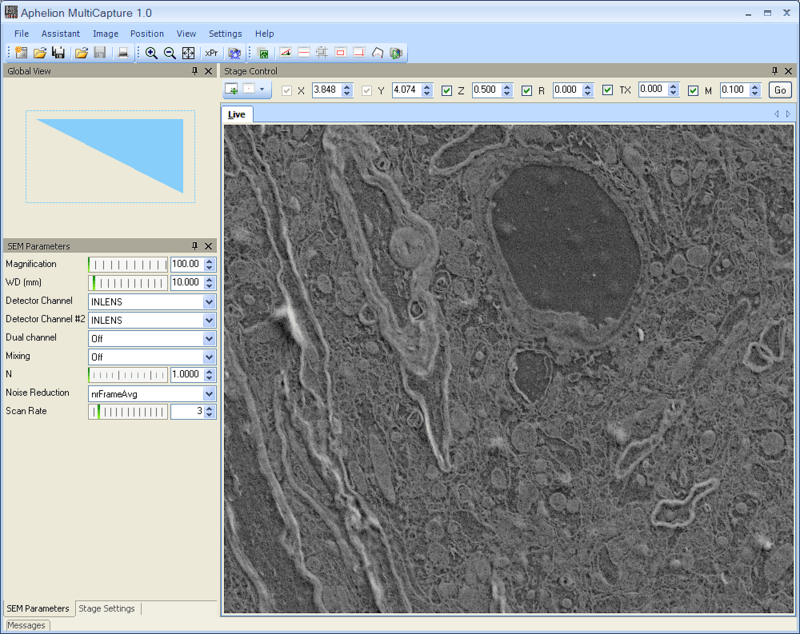 Virtual Image Capture (VIC) is a stand-alone application, available as an optional extension of the Aphelion™ Imaging Software Suite, to automatically control an optical or scanning electron microscope system. VIC provides a very intuitive user interface to scan slides and samples using a microscope1 equipped with an automatic stage. It gives the user a full control to the whole set of acquisition parameters. Value range of the parameters controlled during the acquisition. All capture data, and the set of acquired images is saved as an Aphelion project called Virtual Aphelion Image. The Virtual Aphelion Image format is shared by VIC and Virtual Image Stitcher (VIS). VIS, another software product part of the Aphelion Imaging Software Suite is a very efficient software application to generate a virtual image from the set of sub-images captured by VIC. The Virtual Aphelion Image captured by VIC can be displayed at virtually any magnification within the user interface of VIC or VIS. Users in the medical, metallurgy, and materials science fields can now utilize the processing power of Aphelion Dev, combined with Virtual Image Capture, to analyze large fields or complex microscopy data. For instance, low resolution pre-screens can be combined with higher resolution analysis on specific areas of a specimen that warrant more attention. 1 Contact your local representative for the list of supported microscopes. Call us to learn more about Aphelion Virtual Image Capture. Video introduces Aphelion Virtual Image Capture available for download at the bottom of this page.